INSURER NTUC Income launched a mobile application yesterday to encourage the use of in-car cameras, in a bid to combat motor insurance fraud. The free Orange Eye app allows drivers to use their phone to record footage of the road when mounted on the windscreen with a bracket. The footage can then be submitted as video evidence when making insurance claims. The app comes with an accident detection function that is automatically activated when the user's phone detects a sudden deceleration. It then provides drivers with a guide on what to do in the event of an accident and allows them to send a pre-determined message and map location to their chosen emergency contact. NTUC Income motor policyholders can also use the app to notify the company's round-the- clock accident response team when accidents occur. The insurer hopes the system will deter drivers from making fraudulent claims. Mr Peh Chee Keong, vice-president of motor insurance, said yesterday: "If fraudulent practices persist, motor insurance premiums will inevitably increase. This affects everyone, including safe drivers who do not make any claims." He cited data from the General Insurance Association of Singapore, which estimated that 20 per cent of motor insurance claims are inflated or fraudulent, costing the industry about $140 million a year. Mr Peh hopes the app will help halve that percentage within the next two years, while also helping to settle disputes between drivers who have opposing accounts of an accident. An average third-party claim without video evidence takes around three months to be settled, while one made with video evidence can take as fast as five working days, said Mr Peh. 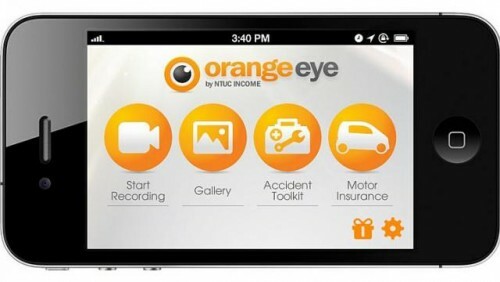 NTUC Income is encouraging the use of the Orange Eye app by offering policyholders a $100 discount on insurance premium payments if they submit video evidence that helps to settle a claim, regardless of which party is liable. Non-policyholders can also claim the discount if they insure with NTUC Income when renewing a motor insurance policy. Mr Marcus Chew, vice-president of strategic marketing at NTUC Income, said: "Orange Eye transforms a mobile phone into a multi-functional device... and underscores NTUC Income's continual innovation for the benefit of our customers." The app will be available from Friday for iPhone and Android devices. If fraudulent practices persist, motor insurance premiums will inevitably increase. This affects everyone, including safe drivers who do not make any claims.